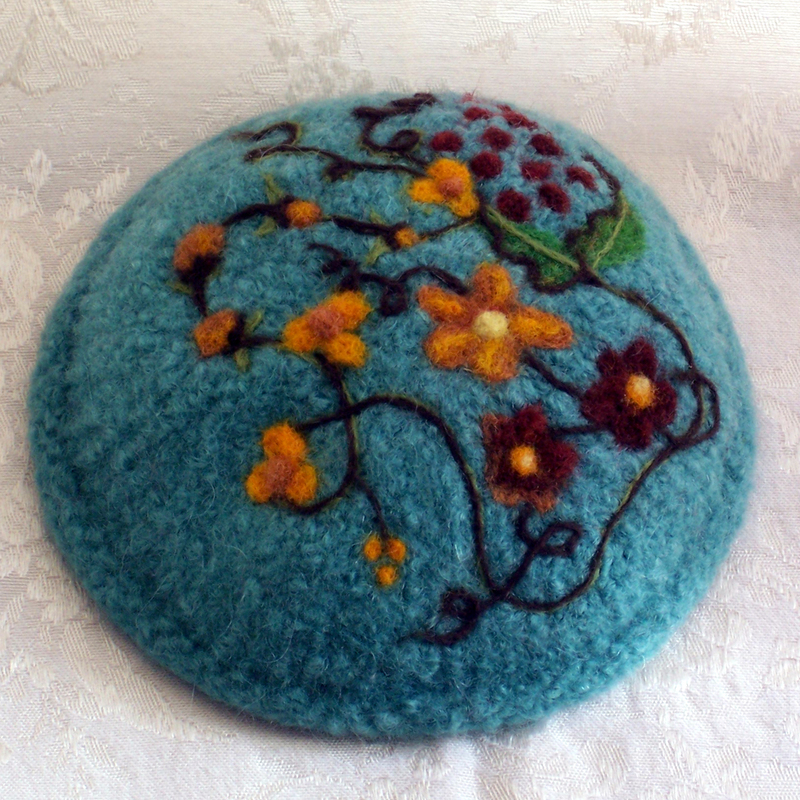 My (Failed) First Attempts at Making Yarmulkes for Men. Why is it that just when you are getting comfortably agnostic again these strange things seem to happen? Back to the drawing board… Yuk and more yuk. 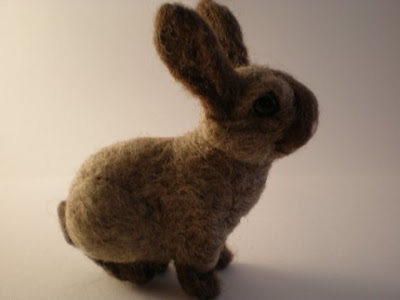 Then … I was inspired by the fluffy box of bunny that arrived in the mail. 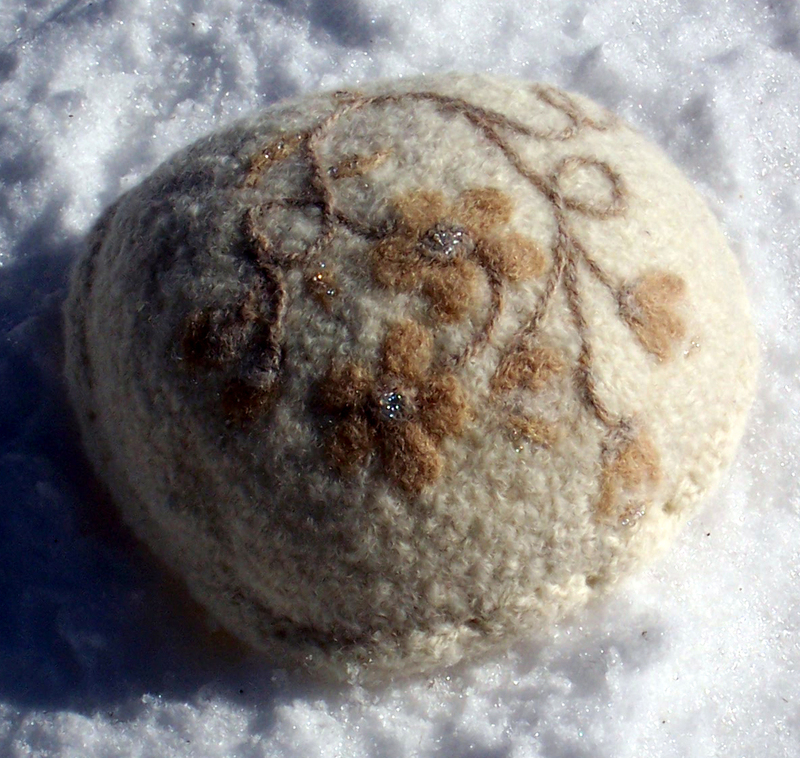 I made this one with pettable softness, yummy angora! The grey tipped leaves are actually the natural fur color. Is that cool or what? I am so glad that blackberrydowns sent me the free sample of grey. It was perfect! Thank you, blackberrydowns . 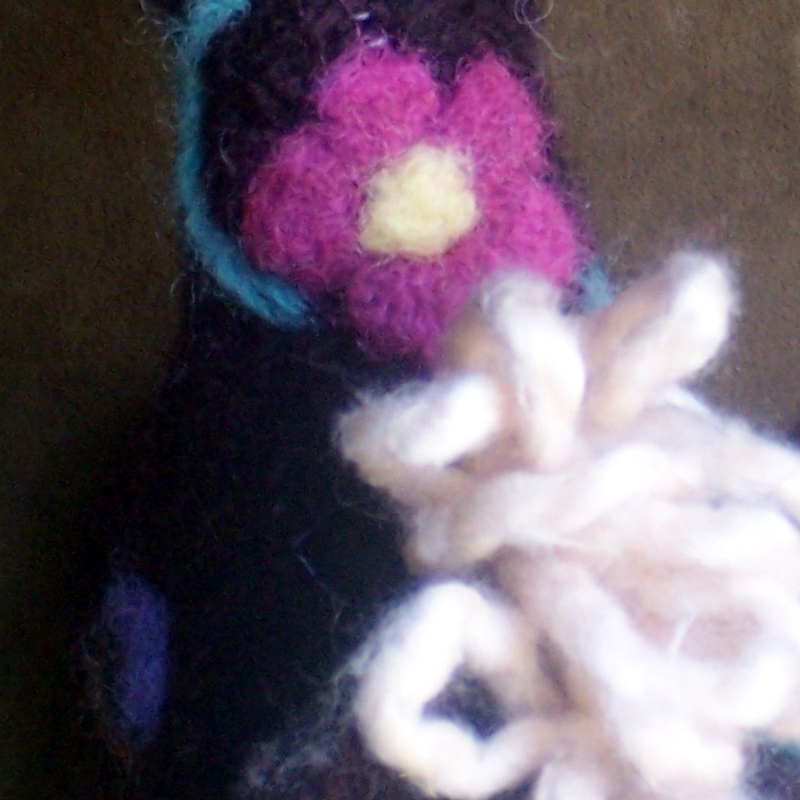 Oh speaking of blackberrydowns, you must see what she can do with a little roving. Spectaculous. Her little bunnies are so real that my old terrier is yapping at the computer screen. Don’t worry blackberrydowns I’ll hold him off… We’ll keep your bunnies safe, at least until my garden is growing, then I show no mercy! 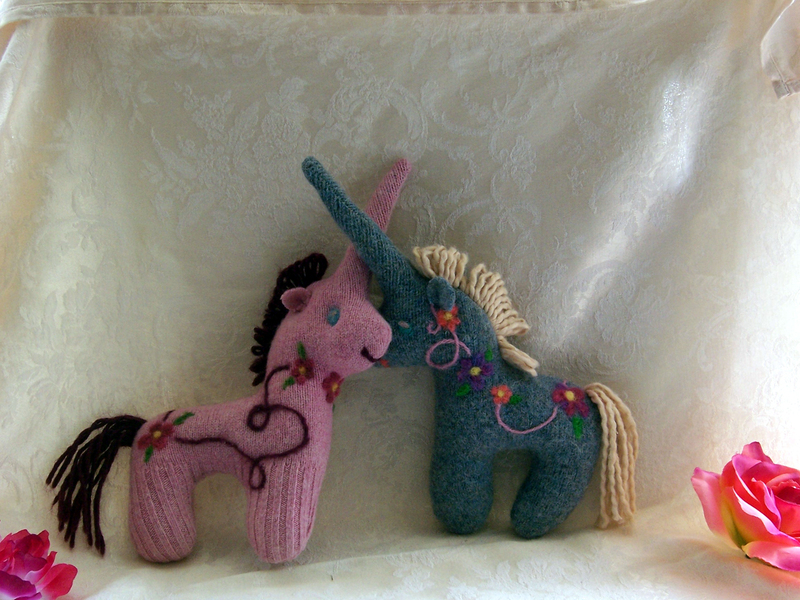 Lots and lots of nunicorns… the herd is growing! 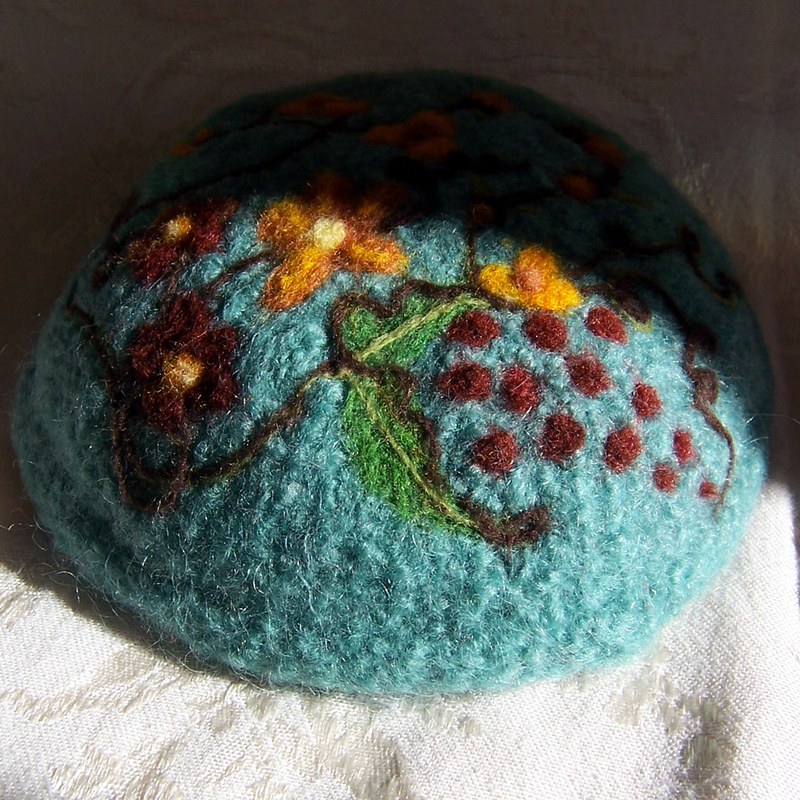 more pics on flickr and etsy. Somebunny’s gonna have a good birthday! She’s just tooo cute! I’m smitten. Can’t wait to find out her name! 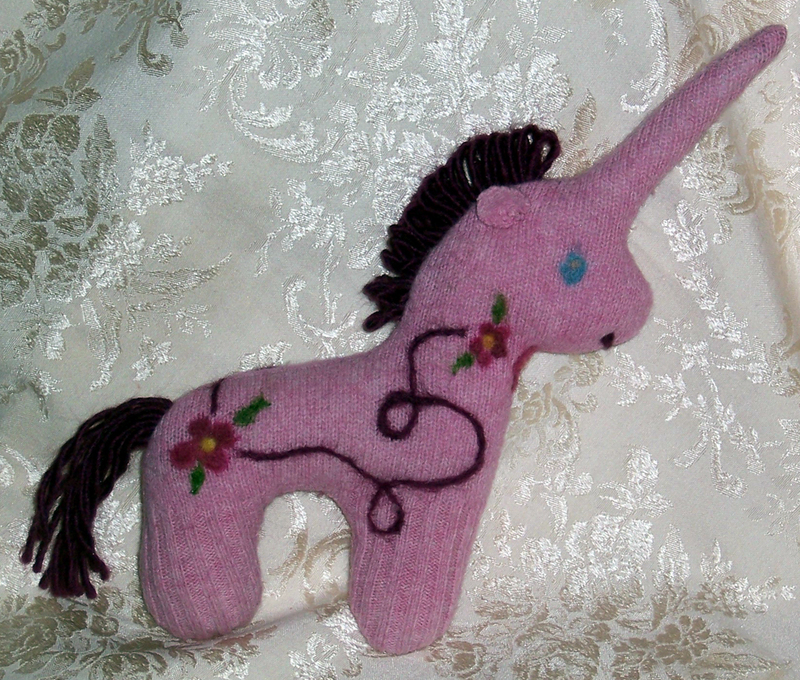 But for now, I’m dubbing her Vernicorn the Nunicorn! Well, we’ll miss them, but they are flying off to their new home tomorrow. They are looking forward to meeting their new friends Charlotte and Julia and are definitely happy to be moving from this nasty cold and snow to the California sunshine! This is my first attempt at Middling offspring. 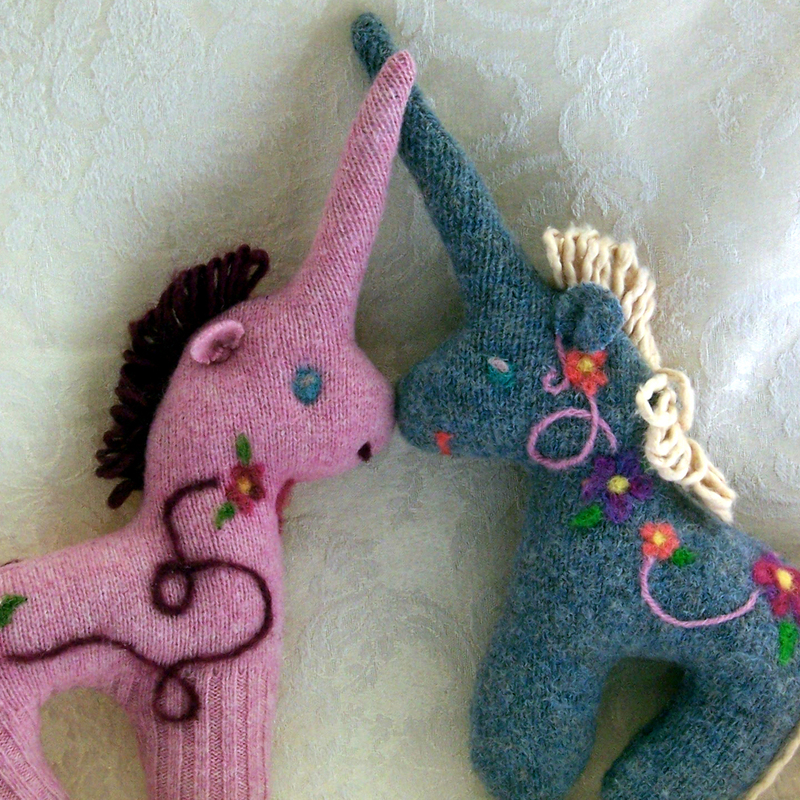 My mother had a great love of unicorns, long before the symbol was popular. She also had a love of toys long after most adults abandon theirs. 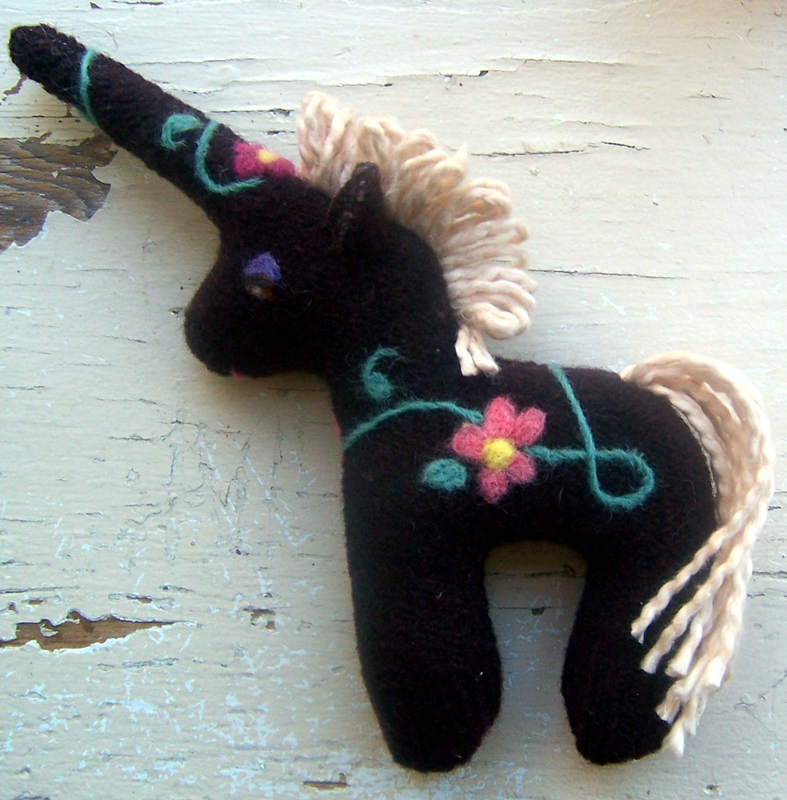 Middling was my mother’s stuffed unicorn. 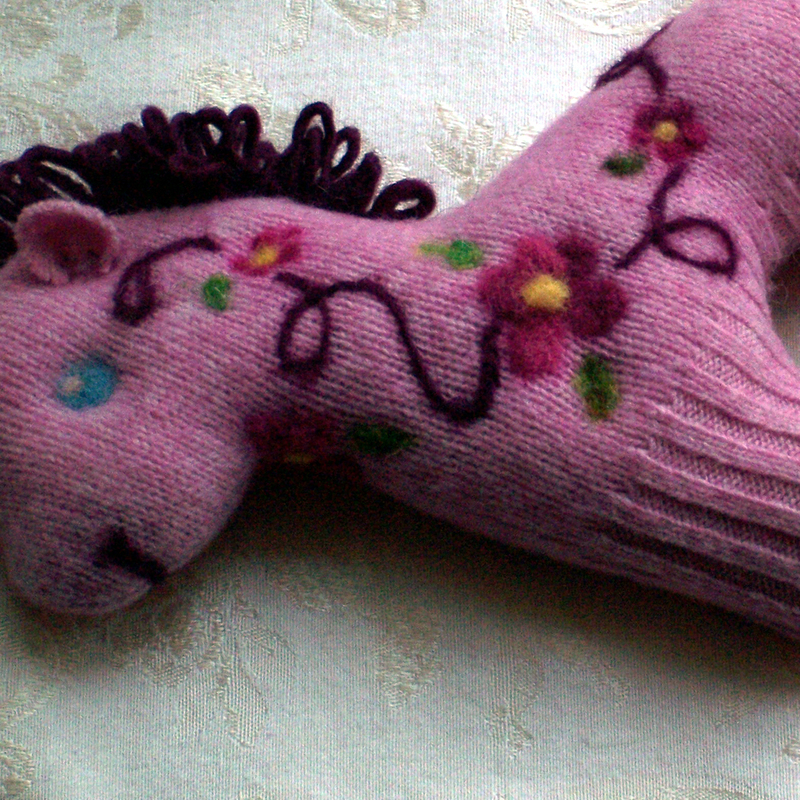 It was the only thing I was allowed to take from among my mother’s belongings when she died. I was, naturally, very attached to her, but in the many moves of my childhood she disappeared. 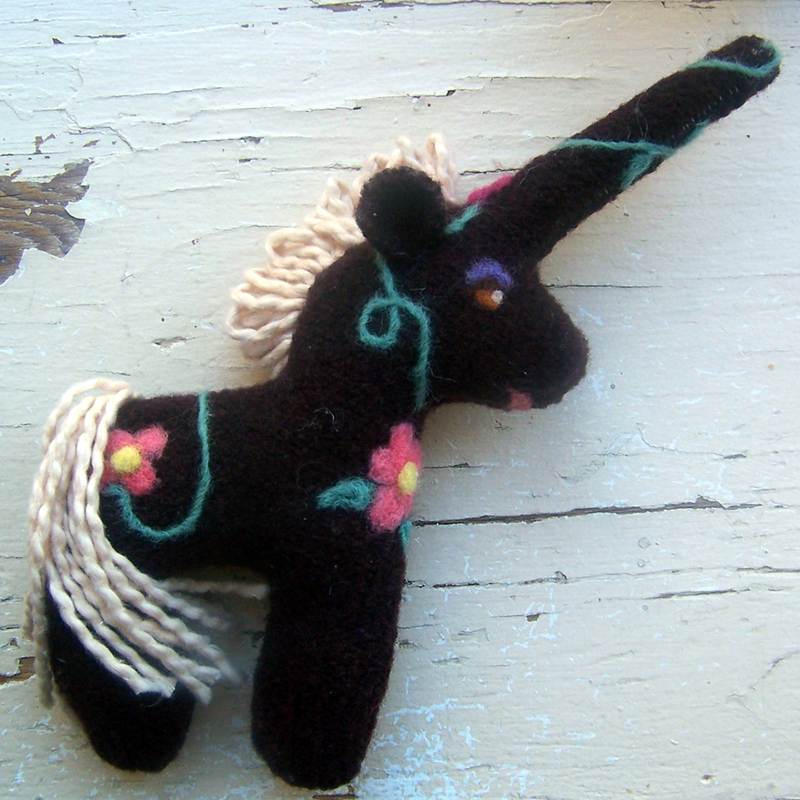 Today this little Middling was born… She is shaped a bit differently from the Middling I remember, and her colors and materials are considerably different. 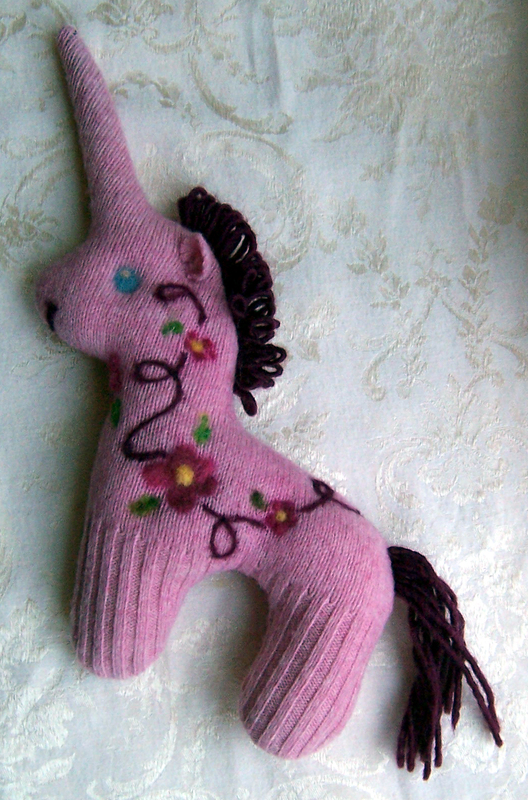 I am sure she is merely step 1 in the evolution of a long lost toy. 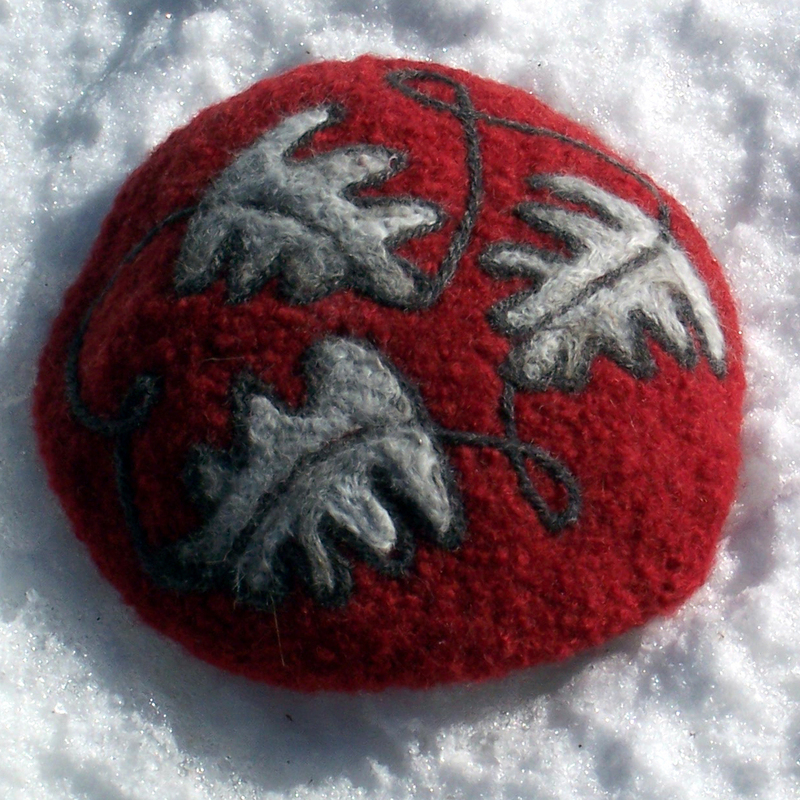 This Middling is made from a recycled wool sweater that was fulled, sewn, stuffed and then embellished with needle felting and love. I finished it yesterday just as it was getting, unfortunately, too dark for pictures. 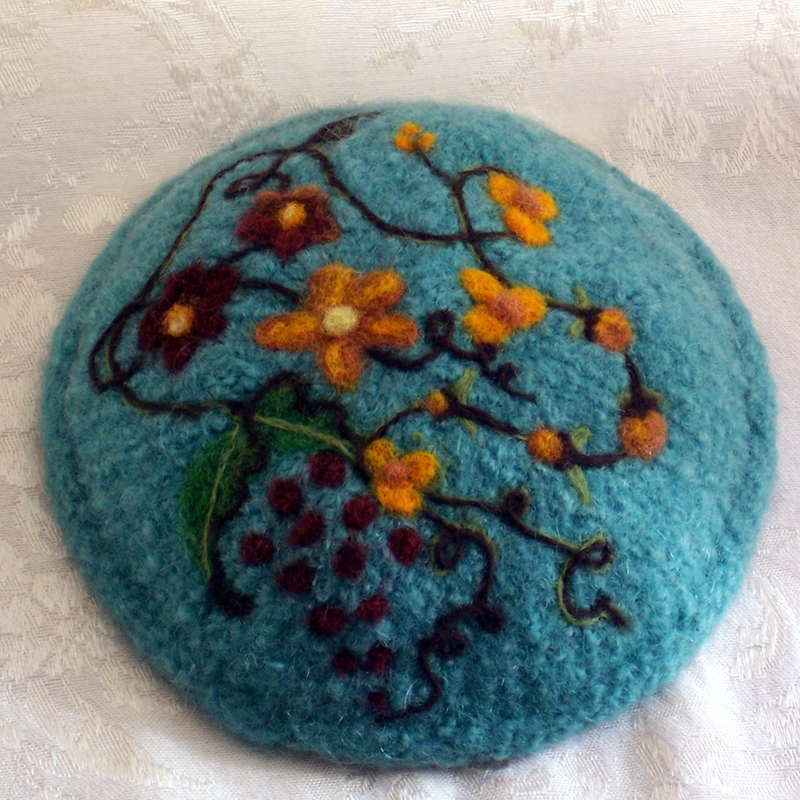 This kippah is made with a different yarn than I normally use for felting. I had to wash it 4 times to get it to shrink almost as much as the others. 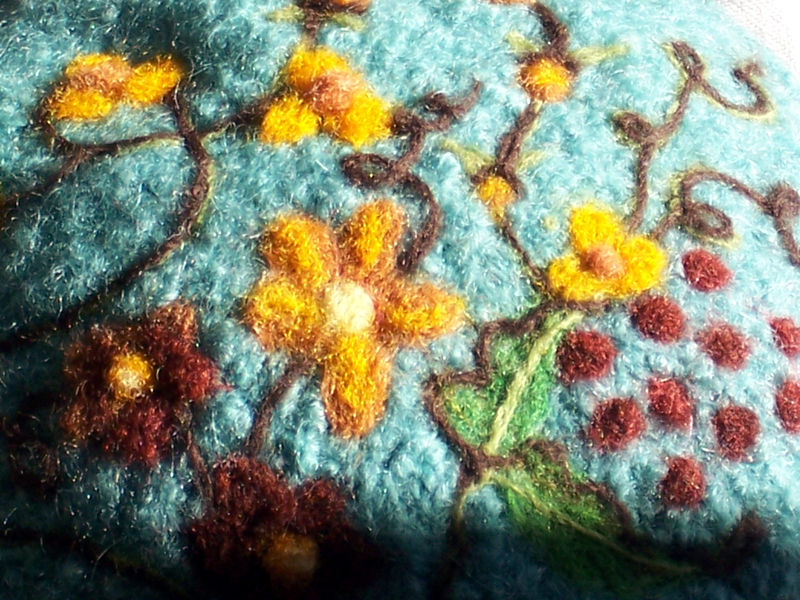 I used Lamb’s Pride which is a wool/mohair blend. 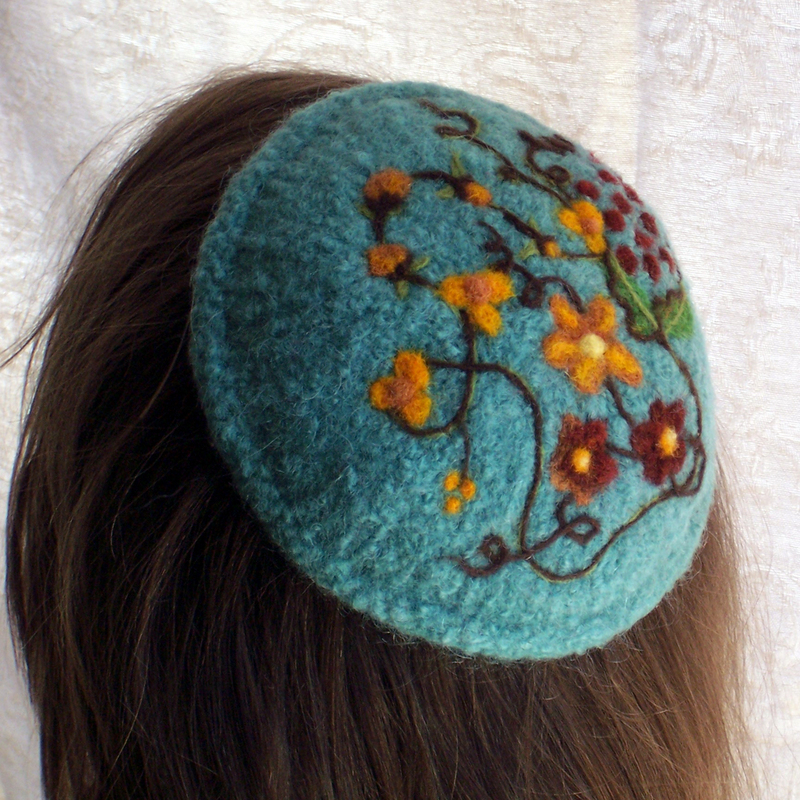 I like the subdued colors of this brand, but it doesn’t full as easily and is a tiny bit scratchier, which isn’t relevant for a kippah so much, but I wouldn’t want to wear a sweater made from it! I took about 40 pictures today and not one of them showed the background color accurately. It is a very pretty and subtle teal color, more green than most of these photos show. 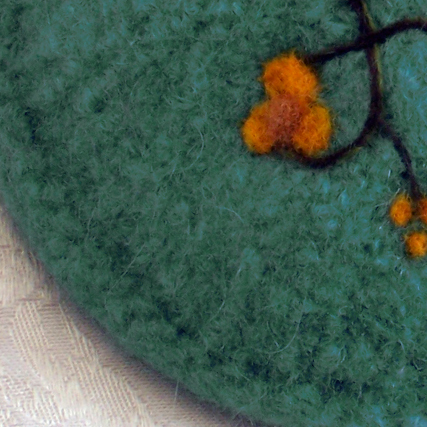 So I manipulated the color on this swatch in Photoshop to get it as close as possible, still not quite there, but it will have to do. Best to see this one in person. This closeup shows the vines nicely. The oranges really pop in sunlight. I really enjoyed making these! Now the question is… will my charming customer be able to chose? I’m not sure I could! 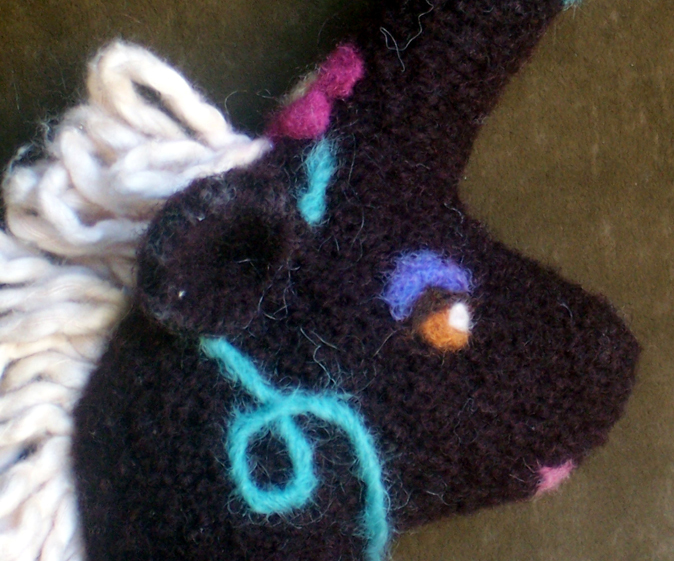 My next project (on the needles) is a knitted and fulled kitty cat… a joint effort birthday gift for a sweet almost-7-year-old friend of my DDs’. 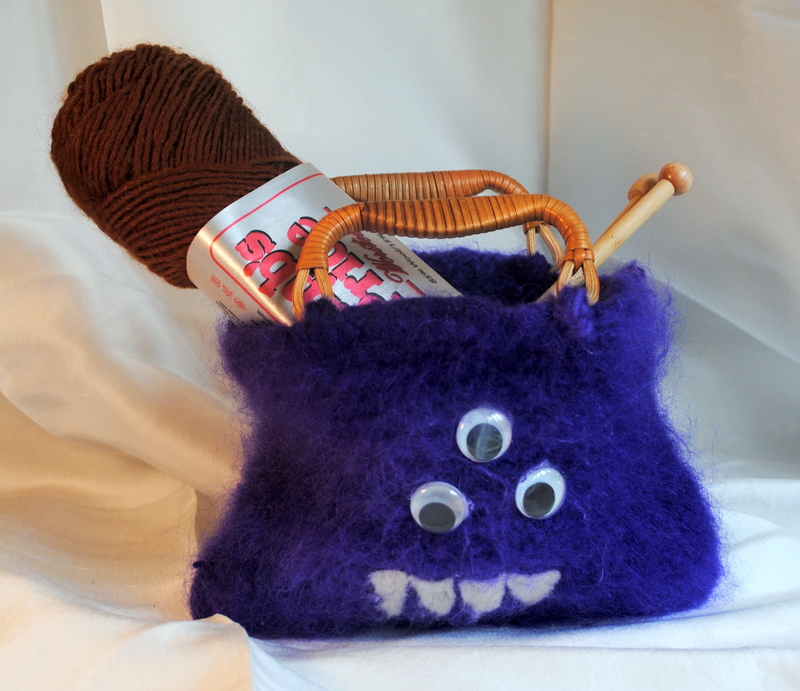 I will be knitting it and Rowan will be felting the face and embellishments on it herself! Fun. Fun. Fun. 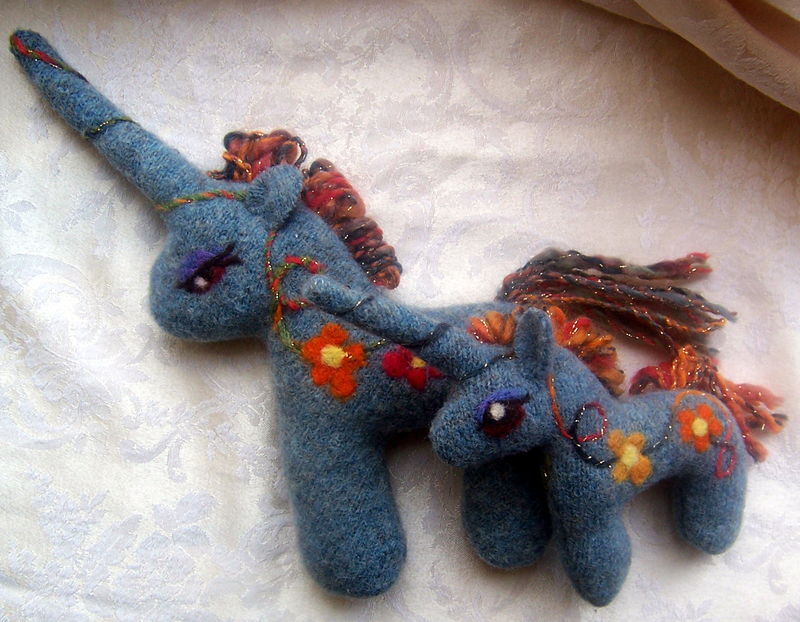 You are currently browsing the archives for the needle felting category.